Youths Of Unknown Ethnicity rioted last night in France. The Telegraph's report wanders to the 16th of its 17 paragraphs before tossing in the word "immigrant," as close as the story gets to accurately reporting on another round of Muslim youth riots in France. The circumstances are familiar. In 2005, two youths fleeing police were electrocuted when they cut through an electrical substation, sparking (pardon the pun) a season of burned cars, wrecked businesses, and cell phone-managed hit-and-run attacks that drove the French crazy. Last night, two youths on a moped and a police car collided, generating a night of the same sort of havoc. And on both occasions, the press was hard pressed to be honest about who was rioting, focusing on economics not ethnicity or religion. These may indeed be riots stemming in part from France's economic and social bias against Muslim immigrants, but they cannot be wholly and fairly reported unless what's preached at the local mosques is also reported. Anyway, here's the police car that was involved in the collision with the moped. Apparently it was chasing the Y.O.U.E.s at high speed, passed them, whipped a speedy U-turn, and hit them head-on. 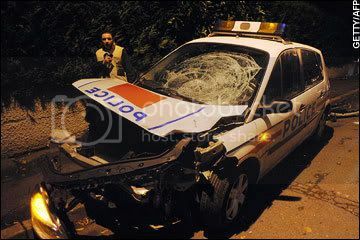 Will this be enough evidence of false rioting to allow the Sarkozy government to bring a quick stop to the unrest? If not, will Sarkozy deal with the rioting more effectively than his predecessor? Will the media ever use the phrase "Muslim youths?"